Strawberry season is in full swing and I have certainly been enjoying it! Last year I tried roasting strawberries for the first time with great results and I was thinking that a roasted strawberry ice cream would be a good idea. Roasting the strawberries seems to concentrate and intensify their flavour and when they roast they release their juices which gets all nice and syrupy and good. While I was thinking about the concentrated strawberry flavour the strawberry and balsamic vinegar combo came to mind as the a splash of balsamic vinegar also helps to bring out the the natural strawberry flavour. As for the recipe, I started with my standard ice cream base and added the roasted balsamic strawberries so it was pretty simple. When roasting the strawberries I place them on a sheet of foil and fold the edges up to make sure to capture all of the strawberry juices that are released. The roasted strawberry balsamic ice cream was so good! I have been experimenting with the number of egg yolks that I use in my ice creams and I have found that the more that you use the creamier the ice cream is and this time I used 3 egg yolks and the ice cream was nice and smooth and creamy. The strawberry flavour in the ice cream was so intense and bright and vibrant and good! This was easily the best strawberry ice cream that I have had and I will definitely be making some more soon. Toss the strawberries in the balsamic vinegar and sugar and let sit for 20 minutes. Pour the mixture on a baking pan covered in foil folded up on the sides to capture the juices. Roast the strawberries in a preheated 425F/220C oven until they start to caramelize, about 15-20 minutes. Place the strawberries and the juices into a container and chill in the fridge. Heat the cream, milk and sugar in a sauce pan until it almost boils, about 5 minutes. You may want to strain the mixture at this point to remove any bits that may have formed while cooking. Mix the cream and strawberry mixtures. 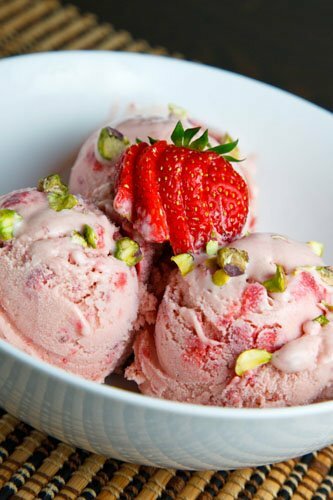 I love your creative idea of a roasted strawberry ice cream – it sounds so good! I continue to be so impressed with your recipes! This sounds so delicious, and the pistachio's are a great touch 🙂 And the picture is great…perfect ice cream scoops! Thanks! What a nice creative idea. Yum! I love pistachios and strawberries and strawberries and balsamic so altogether must be great. Wow, this is so unique! I love the idea of roasting strawberries. Never would have crossed my mind. These strawberries look just right for the summer…balsamic vinegar…yummie! Brilliant idea Kevin. Just love the addition of balsamic vinegar and the pistachios would add a nice bit of crunch. Wow Kevin, that looks amazing! Balsamic and strawberries have a definitely marriage, can't wait to try this! Another winner! I'm gaining weight just drooling over that ice cream. You're so creative! Love your post. What a great idea, Kevin. You have out done yourself again! Sounds fabulous. I have an ice cream maker I haven't used in a long time. I may have to pull it out! OOo I'd love a scoop or two or three of this! I love the idea of roasting them ahead to bring out more of their natural flavors! Delicious! What a brilliant recipe! We love to make strawberry ice cream, but I have never considered using roasted strawberries. So inventive!! I remember the first time I tried balsamic strawberries, and thought, "I do not understand how this is so good…" Putting it into ice cream form is ingenious!! Oh wow. Every once in awhile you make something that blows me away. This is one of them. So simple, yet makes so much sense. Very different and unique! This ice cream must be really interesting tasting! simply delicious! roasting certainly brings out the intense flavors! Can you believe I still haven't tried strawberries and balsamic together? This seems like a good place to start XD. Looks amazing! Appealing like heavan Kevin !! Looks wonderful, never imagined strawberries and balsamic vinegar together. I don't care how many ice creams I try, strawberry is my #1 favorite. This version with the balsamic looks incredible, and roasting the strawberries is genius! Now that I have an ice cream maker I want to give this a try. I love strawberries and I love ice cream! I wish I have a cup of this right now! Whoa. You know I love making ice cream, and this sounds incredible! Strawberry season has pretty much passed in Chicago, but if I see any at the market this week, I'm definitely going to make a batch of this one! Roast strawberries – great idea. I'm making strawberry ice cream today. I'll try it. I like barbecuing them too. The Wagyu – what about wagyu sushi? Kevin, I want a bowl of your ice cream for breakfast! This sounds amazing! I have to try this. –I tried a creme anglaise base for ice cream that had six egg yolks! Wow! That looks so fantastic. I love the combo of strawberries and balsamic vinegar OVER ice cream. It makes complete sense to make it INTO ice cream! Well done! This is interesting, every year I think I will macerate or roast strawberries when they are in season and then I have so much trouble not just eating them fresh since they seem so precious. Pie is as far as I usually get because of great pressure from my bf. That said, I DO really want to try this, maybe I should just buy twice as many strawberries and force myself into it? I love the idea of roasting the strawberry. Very unique! Strawberry ice cream is my favourite and your idea of roasting them sounds brilliant. Pity I have to wait until next year to try this. Wow that sounds like a decadent combination! This is such an interesting ice cream Kevin. Looks delicious. I thought I had eaten strawberries in every possible way, but roasting them is an amazing new one. And a splash of balsamic to boot! Wonderful. This is so elegant Kevin!!!! Serioulsy, I could see this being a dessert at the poshest bistro! What a great and orginal combiantion, great job! Mmm. Balsamic vinegar has been popping up in icecreams all over the place… and I LOVE it! Thanks for verifying what I've been suspecting about egg yolks… are you particular about the eggs you use? I've also been suspecting that better eggs = better icecream/custard. This looks fabulous and sounds so flavorful. I can just imagine how creamy it is. Lo: I have not tried using different eggs yet. Maybe some farmers market fresh eggs would be even better. Kevin, this is such a luscious ice cream! My kind! This is such a unique and delicious looking ice cream, gorgeous! never roasted strawberries. what lovely flavors Kevin! Roasted strawberries sound delicious! lovely click! You beat me to it! I've been thinking about making those wonderful roasted strawberries of yours into an ice cream ever since I made that salad. I've made something similar and 'tis delish! Nice photos Kevin! This sounds delicious. I'm adding it to my list. Just amde some strawberry balsamic jam last night so I right there with you. Its a wonderful taste. I so need to have it in ice cream form. Oh my!! And I thought the strawberry ice cream we made last night was good (using strawberries, sugar, 18% cream). But this sounds great! I love the addition of the balsamic vinegar. I think I roasted the strawberries a little too long as the color of my ice cream is a little darker, bordering on burgundy. It's still extremely delicious however, and a bit jammy. I'd imagine this would also be delicious with some shaved chocolate or chocolate chips. OH and you'd better believe that I licked the strawberry roasting aluminum foil fully before discarding. Oh my – this looks incredible, and I'm not even an ice cream person. Gorgeous. Oh boy this looks good. I just did a strawberry project on my blog and tried strawberries with balsamic. I wish I had tried this too! Great combo! I've never thought about it for ice cream before! I've gotta try this! Looks beautiful with the pistachio garnish! very very yummy Ice Cream a water is coming in my mouth ………………after seeing this first i am going to buy a Ice Maker after that i will………….. try thnx for such a nice post…………. I've done strawberry balsamic ice cream before–but roasted! Brilliant!! Love your pictures, too! Thanks for posting this recipe, it was outstanding! making a second batch of the roasted balsamic strawberries. Pureed them w/an additional tbsp of sugar, then added a tbsp of good Port wine. Served it as a topping or plate schmear. A little goes a long way as the flavors are concentrated and intensely strawberry! …it was a great addition and really brought out all the flavors of the ice cream.